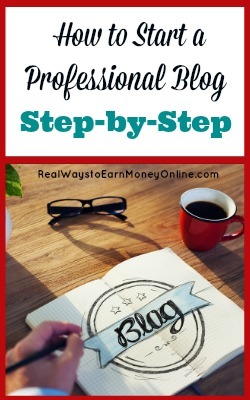 I get many, many reader questions about starting blogs and how to make money with them. There are already a lot of posts here on this blog about doing that, but I thought it would be a good idea to create a page to get you started down the right path. In my six years of blogging I've learned a lot, but I've also made lots of “newbie” mistakes that you can avoid! So, speaking from personal experience, here's what I suggest if you want to blog professionally. Keep in mind that blogging professionally will require an investment of time and money and it's also not a fast way to make money, but it's very rewarding and can pay off well if you just stick with it. Can You Make Real Money? Absolutely. Blogging is my full-time job and more than pays the bills. However, I wasn't able to claim “full time blogger” as my job title until around 2013. It was then that my blogging income finally surpassed what I ever made working outside the home. So yes, you definitely CAN make real money! But don't quit your day job until you see that you are, and it proves to be a consistent income stream. Blogging is one of those things you have to work at and work at, experiment constantly, and never stop learning about before you see real results. And, not everyone likes a challenge, nor does everyone enjoy putting hard work in for a long time and not seeing much return on their efforts. So you really have to enjoy the process. What Can You You Blog About? You can blog about anything you want! But, if you want to get traffic/earn money, your blog needs to cover a topic people are actually interested in and also a topic you are interested in. For example, my blog is about working from home. People are interested in that. I'm interested in that, too. It's been a perfect fit! You could also start a food blog. Or a crafts blog. Or even a money-saving blog. The sky is truly the limit. Many people are initially tempted to just start blogging about their day to day lives. This is fine if you just want to blog as a hobby, but it's not fine if your ultimate goal is to earn a living with your blog. You have to remember that while your day to day life may be interesting to you, your friends, and your family, it is not interesting to people who don't know you. Therefore, you'll likely never get much traffic nor make very much money. If people are interested in the subject matter, you can get traffic, earn money, and work from home on your own terms. But again, it takes time and patience. When you're set up on a free blogging platform, you don't really own your blog. You're just setting up on someone else's property and you're at their mercy if they decide they don't like your blog (and sometimes they do delete blogs when they decide that). So, to start, I'd suggest avoiding Blogger, WordPress.com (different than WordPress.org), Weebly, etc. You need to be set up with a self-hosted WordPress.org blog if you want to be a professional blogger. Exceptions would be if you're planning a primarily hobby or personal blog that you're NOT intending to make money, or much money, from. Already Set Up On a Free Platform? Are you already set up on a free platform? Don't worry — you can get moved. You can either attempt to move yourself by simply Googling how to do it, or you can let a professional do it for you. This won't be free, but it will save you a lot of headache and time. You'll need to host your blog somewhere. The idea of “hosting” is confusing to new bloggers, but basically your hosting account is just a way for you to make your blog/website accessible via the internet. If your domain isn't connected to a host, no one will be able to visit it. For cheap, fast, and easy hosting for brand new bloggers, many people recommend SiteGround. You can buy your domain name and host at SiteGround all in one. This is so much easier! And hosting at SiteGround only costs you about $3.95 a month for the least expensive plan, which should be fine if your blog is newish and doesn't get a ton of traffic yet. You can always change your plan later if you find that one isn't working for you. SiteGround is one of the least expensive, uncomplicated, and fastest ways to get a blog up and running today. Plus, they offer a money-back guarantee good for 30 days after you purchase your plan, if you decide blogging isn't for you after all. I have step-by-step instructions here for getting a WordPress blog up and running with SiteGround (should take ten minutes or less to do). Note that I personally use Liquid Web. They're a little more expensive than SiteGround, but I have excellent up time and their support is phenomenal. As my traffic grew, I ended up needing to use a pricier service. Their standard plan is about $1.62 per day. I use their Storm VPS. I would definitely recommend looking into Liquid Web if you get more than 100,000 page views per month on your blog. Their support is very helpful and will answer any questions you might have to get up and running. Once your domain name and hosting account are set on SiteGround, you're ready to install WordPress and start building your blog! SiteGround makes this pretty easy for you. If you can't figure out how to do it on your own, you can simply contact them via live chat and have them do it for you. Once WordPress is installed you should be able to type yourdomain.com/wp-admin or yourdomain.com/login in the address bar of whatever browser you use and put in the credentials you set up when you installed WordPress. If you are seeing your WordPress dashboard when you type in your domain name followed by wp-admin or login into your address bar, that means your blog is online! Your WordPress theme will have a direct effect on what your blog looks like. WordPress comes default with the Twenty Fifteen theme and it's fine and functional, but a lot of people like to experiment with other themes. There are lots of great free themes and there are also some very sleek, professional paid ones. Like most people, I started with a free theme and ended up upgrading to paid themes. I personally use the Genesis framework and my child theme was purchased from Restored 316, a designer with tons of beautiful, feminine themes and step-by-step tutorials for setting it all up. You have to purchase the Genesis framework separately (around $60) and install it first, and then install your child theme. These are usually also around $50 to $75. So, for a professional theme, you shouldn't be out more than $100. Even though the really nice themes cost money, they are usually NOT revolving charges like your host account and your domain. Once you've paid for Genesis, it is always yours. Same with any child themes you might purchase. Broken Link Checker – Lets you know when links break on your sites so you can go in and fix them. Yoast – I love this one because it makes you be mindful of SEO (search engine optimization) as you write your posts, plus it has lots of extras, including an XML sitemap to help your site get indexed faster. I use the free version. Wordfence Security – This keeps hackers out and is a must-have for any blogger. At some point, someone WILL try to hack into your site. Make sure they can't do it. WP Optimize – This cleans up unnecessary space — spam comments, saved post revisions, etc. WP Super Cache – This will speed up your page loading time. If you make changes to your blog and then go look at it and don't see them, just use this plugin to clear your cache. Another good (although not as easy to use) is W3 Total Cache. Jetpack – A lot of bloggers don't like this one and claim it slows their blogs down, but I personally love it because it gives you so many things all in one. The two things I'm using it for now are related posts, which shows related posts under all my blog posts, and commenting. When I use Jetpack's commenting system, I NEVER get spam comments. I mean, like never. Maybe two a month. Want to know what other online tools I use to run my website? See this post with ten blogging tools I can't function without, plus these 7 that I actually pay for (and find they are well worth the money). If you want a custom logo for your blog, you can attempt to make your own using PicMonkey (they do have a free trial) or you can pay someone on Fiverr to do it for you for just $5. I've done it both ways and had good luck. PicMonkey is also great for creating custom images for your blog posts. If you use Fiverr for this (or any other service), be sure to use coupon code MAXB20 to get 20% off. If you don't want to pay, Canva is a free tool although I do find it a little harder to use. It goes without saying most people (unless they attended law school) do not know how to write various disclosures, disclaimers, policies, and contracts so that they are professional and will cover you legally. Fortunately, there are resources online where you can purchase templates for these things so that they are worded correctly and get them place. The first thing you'll soon realize once you start writing is that people don't just appear at your blog to read what you've written as soon as you hit that publish button. Yes, eventually Google will index you in search and you might start to see a small trickle of visitors from that, but traffic is just not an overnight thing. When I started this blog, social media was in it's earlier days, so I was pretty dependent on the search engines picking up my content to get any traffic. But now social media makes up a large portion of the traffic I receive, and I'm no longer dependent on just search engines for getting people here. Don't waste time — as soon as your blog is online, create a Facebook, Twitter, and Pinterest account for it and start using them. Every time you write a post, share it across those networks! Just like traffic to your blog, building up a following on those sites can take time, but it's worth the effort if you're serious about blogging professionally. You also need to set up a newsletter as soon as possible, put an opt-in form somewhere on your site, and start collecting the emails of people who have visited your blog. Emailing them at least once a week is the best way to get them to come back! I use ConvertKit for my newsletter service, but you can go the free route if you'd like and use MailChimp. For more ideas on getting blog traffic, read my post — 8 Ways to Get Traffic To Your Blog. Speaking of traffic, you'll need to keep tabs on it so you'll know how many people are actually visiting your site. I use Statcounter and Google Analytics for this, but you don't have to use both. Google Analytics is the most recommended option and I use it for more detailed stat-tracking, but I like Statcounter a lot because it's so easy to read. Statcounter tends to be my go-to for “at a glance” stat checking throughout the day. I know this info is a lot to take in, and I would never suggest that someone dive into blogging head first and try to do EVERYTHING I listed above all at once. If you do, you'll overwhelm yourself with information you haven't had time to process and give up long before you ever get anywhere. For that reason, I recommend investing in a blogging e-course. Blog By Number – $47 – This course was created by Suzi Whitford of Start a Mom Blog. It's ideal if you can't afford to spend much on a course and you also do not have a blog set up yet. Suzi walks you through everything step by step, beginning with setting up your domain name and hosting, getting traffic to your blog, and making that first dollar. It's detailed and very high-quality, and as a professional blogger who's been through a LOT of courses, I can tell you it's worth every penny of that $47. Elite Blog Academy – $797 – This course was created by Ruth Soukup of Living Well Spending Less. It's ideal if you can afford to invest a lot into learning how to make a full-time income from your blog and you ALSO already have a blog set up online. If you do not even have your blog set up yet, I'd recommend reading my post on how to set up a blog for help, or possibly taking Suzi's course (above) that is geared more toward newbies. If e-courses aren't something you enjoy, I do have a list here with some helpful blogging e-books you can check out instead. These are a lot less expensive than courses and might be helpful if you're just trying to get a feel for what you're getting yourself into with a blog.